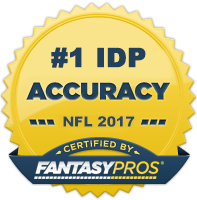 These are The IDP Guru's Weekly IDP Sleepers (for redraft leagues). This page will be updated each week to properly reflect that current week's rankings. This is just a general sleeper list. It is not listed in any particular order. The "Match-Up Strength" is based off of the latest IDP Points Allowed by Position document. These numbers are to be used directionally early in the season. As the season progresses and more data builds, the accuracy of the match-up information increases. The color key for the strength of weekly matchups is listed below.